The Nevada Gaming Policy Committee is about to do something that marijuana users are known for: waste time. 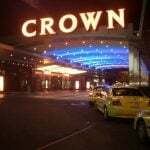 On Wednesday, the 12-member panel will begin reviewing whether the state’s casino industry can find a way to coexist with recreational and medicinal cannabis businesses. The odds are seemingly very long of that actually happening, but nonetheless, the committee is moving forward with a review. Cassandra Farrington, the CEO of Marijuana Business Daily, a Colorado-based news outlet that covers all things cannabis, will provide commentary on why the drug should be allowed inside casinos. Nevada Department of Taxation representatives will also attend the Wednesday meeting. The federal government maintains that marijuana is still a Schedule I drug along with heroin, LSD, and ecstasy. Attorney Brian Barnes will explain the government’s position and how it relates to potentially allowing casinos to welcome marijuana events. Nevada voters approved recreational marijuana during last November’s election. The ballot question passed 54 percent to 46 percent. The recreational use law allows only for private consumption. The Gaming Policy Committee is made up of some of Nevada’s most influential leaders. Along with Governor Brian Sandoval (R), the committee includes the CEO of the state’s largest employer, MGM’s Jim Murren. The Nevada Gaming Police Committee’s review presumably won’t lead to casino floors becoming inundated with pot. It was just last summer that the state’s Gaming Commission extinguished any rumors that gambling and marijuana might be able to work together. The commission directed casinos to keep marijuana use out of their resorts, and refuse conventions and events that are linked to the cannabis industry. Wynn Resorts went so far as to refuse membership of its rewards program to a known marijuana industry businessman. 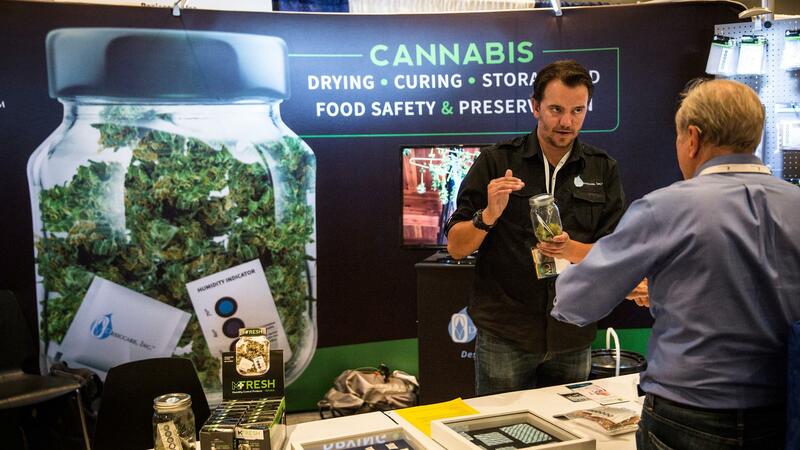 The Marijuana Business Conference and Expo, the largest cannabis conference in the world that was held earlier this month at the Las Vegas Convention Center, drew over 10,000 attendees and 700 vendors. But casinos are currently barred from welcoming that event to their properties. 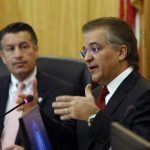 Proponents of allowing Nevada’s resorts to deal with businesses linked to marijuana feel that Sin City is the perfect locale to lead the drug’s evolution into a more mainstream and accepted product. In Colorado, where recreational weed has been legal since 2012, the state collected more taxes last year on its cultivation and consumption than it did from the sale of alcohol. 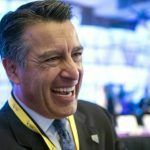 Nevada expects to raise $120 million in annual marijuana taxes once the market is fully matured. 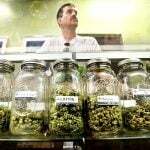 Marijuana producers pay a 15 percent wholesale tax, which goes to state schools. An additional 10 percent tax is levied, and that money goes to Nevada’s “rainy day” fund. What about the majority of people who don’t smoke and don’t want too breathe the second hand smoke? What about reducing smoking in this country. If this starts in the casinos I will never go back and I am a frequent player.l.still hoping for the day all smoking is stopped in the casino. Again, why is something harmful to everyone even being consider, what about the 80 percent in the country that do not smoke anything, the smell of this crap is very offensive. This is really sad the direction we are going in this country. I just got back from Nevada and felt like a criminal to smoke what I like in a legal state. I don’t think it would be a stretch to have the casinos to allow marijuana smoking in a certain room away from the crowd and where the air won’t be known to others. I think the real reason is that they don’t want to see their alcohol sales drop, but they may find out that stoners might just still like to gamble, so this could be win-win. The way things stand now, the tourists to Nevada lose out over the confusion with the laws.